Each year, I read this report with great anticipation. As a leading business intelligence and analytics solution, Tableau provides the industry with thought leadership and predictions. This years’ trends report is no different. While reading Tableau’s 2019 BI trends report, I thought it would be fun to look back at 2018 to compare how the trends have evolved. You might like to look back at even earlier years as well. You can find each year’s report from Tableau with a quick Google search. Let’s look back and see what’s new, what has stayed the same, and perhaps make a few cautious predictions of our own for 2020. Natural Language Processing has progressed over the last 3 years and is now laying the foundation for new and quicker insights. This emerging trend is really starting to take shape with BI tools and Tableau is leading the way. Cloud – the cloud is here to stay. Companies continue to evaluate and move to the cloud at increasing speeds. Leveraging cloud resources continues to make economic sense for most companies. Data Democracy/Self-service analytics – everyone should be able to explore their data. The question is, will they know how, or will people take the time to learn? Data Governance – good governance practices are critical for trust and success in BI. The latest BI trend report from 2019 builds on last year’s report with several new additions. One prediction that stood out to me was #8 – Enterprises get smart about analytics adoption. BI solutions are often deemed “complete” when they are rolled out to the users, but merely providing access to BI solutions is not the same as adoption. Organizations are re-evaluating how BI adoption plays a part in a strategic shift towards BI modernization, because true value isn’t measured by the solution you deploy, but by how your workforce uses the solution to impact the business. Going forward, I suspect more and more businesses will leverage concepts like change management to improve adoption for new BI and analytics strategies. You can see the highlights from the 2019 predictions below. As organizations rely more on artificial intelligence and machine learning models, how can they ensure they’re trustworthy? Many machine learning applications don’t currently have a way to “look under the hood” to understand the algorithms or logic behind decisions or recommendations, so organizations piloting AI programs are rightfully concerned about widespread adoption. Advancements in NLP systems enable all people to unlock natural conversation with data. BI platforms evolve to put data where people want to act. Focused on efforts from public and private-sector organizations strengthen ‘data for good’ movement. Considering regulations like GDPR, leaders assess the future of ethical data practices. Governed data curation bridges the gap between data and business. Finding and communicating data insights is now a team sport. What happens when leaders focus less on adoption and more on engagement? Data scientists develop soft skills to drive organizational change. Data is moving to the cloud faster than ever, driving organizations to rethink their data strategy. So how does 2019 compare to 2018? In 2018, the promise of NLP became real. As mentioned already, NLP has been an emerging trend for several years now. Companies in all industries began to get traction with their NLP programs in 2018 and leverage the technology to create real business value at increased speeds. Technology companies and products are working to make everyone’s life a little easier and I think NLP has great promise. We already have so many voice-enabled devices and our BI solutions are not far behind. I predict we will be able to interact with our BI tools much like we do with Alexa and Siri. Check out the highlights from 2018 below. 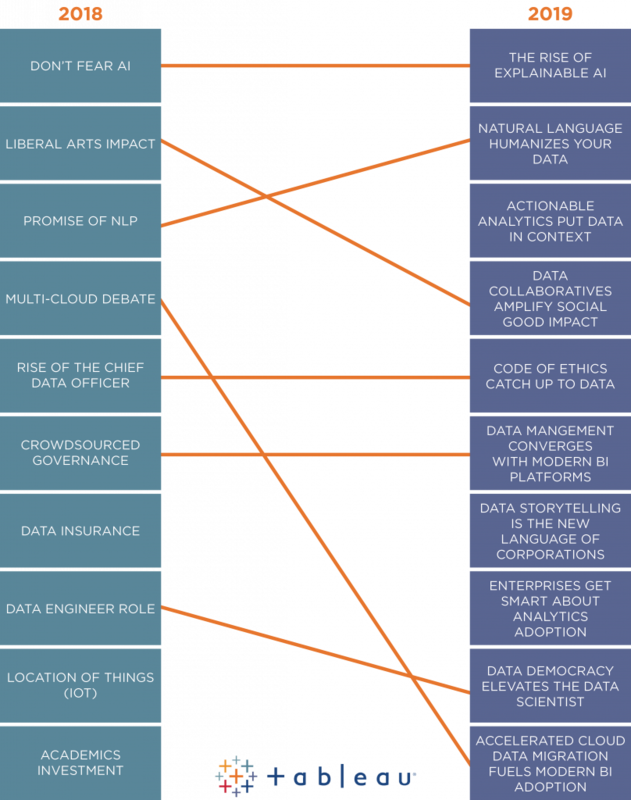 The human impact of liberal arts in the analytics industry. The promise of Natural Language Processing will grow in prevalence, sophistication, and ubiquity. The multi-cloud strategy moves forward in 2018 with many organizations moving their data and their applications to the cloud. Data and analytics are becoming the core to every organization. That is undebatable. As organizations evolve, they’re prioritizing a new level of strategic focus and accountability regarding their analytics. Vulnerability leads to a rise of data insurance. The increased prominence of the data engineer will continue. Analysts and business users can’t create dashboards and visuals without having all their charts, and to do this they will need a reliable data source to work from. Understanding data types, the flow of data, and databases will continue as an important asset to companies. The location of things will drive IoT innovation. Location based data with IoT devices is adding new value to analytics. By knowing where an IoT device is located, it allows an analyst to add context and better understand what is happening and what will happen in a specific. What new or old trends stand out to you? Do you agree or disagree with any of the predictions listed above? Join the conversation and let us know how you are transforming your daily work with data-driven insights.